The historical and monumental town of Viana, 81 Km from Pamplona and 9 from Logroño, is situated in the south-west of Navarre, between the Sierra of Codés and the fertile plain of the Ebro.Its foundation dates from 1219 when the Navarrese king Sancho VII el Fuerte reconstructed it, conferfing upon it the “Fuero” or the “Eagle Concession”. The archaeological excavations are bringing to light about fifty prehistoric and historical sites which confirm this area is one of the richest ones. Viana is home to many gems: it´s a town charged with art and history, an authentic museum of civil and religious architecture, whose acces was gained thought five old ramparts that were closed every night until the end of 19 th century. Its streets should be gone over in an unhurried way, allowing us to be amaze by its impressive ancestral homes and emblazoned fronts that evoke its flourishing past. We might start visiting the Saint Peter ruins (next to the hotel) where a wonderful view can be admired: Sierra (range) de Cantabria, La Vega (meadows) del Ebro, Logroño, la Sierra de la Demanda with San Lorenzo (2040m). After passing ahead of the house where Navarro Villoslada, a famous writer “Cantor de la raza vasca”, was born, we arrive at Santa María de la Asunción church, an architectural jewel which amazes due to its magnificence. Its impressive main front, built between 1530 and 1560, is considered the most amazing stone work the Navarrese renaissance. At its foot Caesar Borgia is buried, who was a legendary character, supreme commander of the Navarrese army and Pope Alexander VI´s son. In the Gothic naves there are hidden treasures such as Luis Paret´s paintings who, together with Goya, is considered one of the best painters of the 17th century. Beside Santa María church is the Fueros Square that is the centre of the town´s activity. The town hall, built out of stone, and the fountain, steemed by the locals and visitors alike, turn this square into an unique place where pilgrims can rest. The Coso Square is dominated by the bull balcony of the town hall. It was here where was situated the castle-fortification that protected the Kingdom from the Castilian attacks. Unfortunately, there is only a stone wall left as a silent representation of glorious days. Outside the ramparts you can visit the convent and San Francisco church at whose main door is the Caesar Borgia´s bust. Within the municipal limit there are two important points: the nature reserve of La Laguna de las Cañas. It has a great ecological value due to the diversity of birds that live and nest there. This reserve has an Interpretation Nature Centre in which the water life can be observed and you can get information about the different species. The Hipogeo del Longar, the second sight is a 4000-year-old subterranean funeral monument which was discovered recently and has already been restored. It is thought to be one of the most original and important in Navarre. Viana is the last-way stage in Navarre. It has been enriched culturally, economically, artistically and spiritually by the so-called “French Way”. There are some traces left of this relation: the Pilgrim Hospital with its Gothic salon (a culture house today), the ruins of La Orden Monastery, the Cuevas hermitage (close to Las Cañas) or the ruins of San Juan del Ramo Convent (on the road to Aras) where the crown prince Carlos of Navarre spent large periods. Nowadays, Viana is an ideal place to end a stage and enjoy the street atmosphere and its citizens’ cordiality and kindness. – Tourist itinerary through nearby villages: Torres del Río and Santo Sepulcro, a Romanesque church whose octagonal nave is higher than other churches. Inside, the cupola has a ribbed vault shaped like an eight-pointed star that suggests Moslem inspiration, which evokes the Cordoba mosque. Los Arcos whose church has one of the most beautiful towers of Navarre. The Basilica of San Gregorio in Sorlada, a rococo jewel in which a wonderful sight and special rocky formation can be admired. The Sierra de Codés with the monastery from where you can climb Ioar Mountain (1414m). – Excursion to Val de Lana (Valley of Lana): a peculiar geological enclave in which the charcoal production has endured. It is an ideal place to visit the five villages that compose it. – Excursion to nacedero del Urederra (source of the Uredera stream): It is situated in the natural park of the Sierra de Urbasa. The way that leads to it goes across an old glacier cirque. The water of emerald colour justifies the river’s name since Urederra means beautiful water in Basque. – Excursion to Rioja Alavesa: we can visit the roman bridge of Mantible, the medieval town of Laguardia, the village of La Hoya and the cellars of this area (an old Principality of Viana) with their recognized wines. 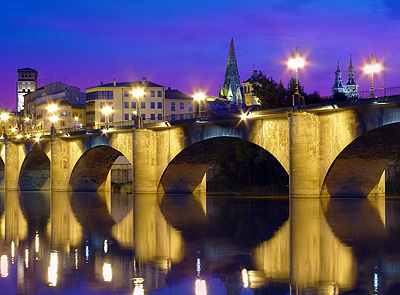 – Visit to the nearby town Logroño: to enjoy its monuments, its gastronomy and to go shopping. – San Anton, the 7th January: bonfires are lit the day before and garlic, potatoes and chorizo are grilled. – San Felices, the 1st February: it is the commemoration of the founding of Viana (1219) when the first stone was placed on San Felices gate. Every year a drummer crosses the streets to call children. Then they go to mass and when they come out they receive a coin from the authorities as reminiscence. – Carnival: it is celebrated at lent. It is quite a recent tradition that attracts a lot of people who want to have fun. – Pilgrimage to Cuevas, Easter Monday: the last Navarren sanctuary on the Road to Santiago. The Cuevas Virgin enjoys the veneration of local people who assemble this day. If the weather is good, people eat there and the party goes on until nightfall. – Exhibition of handicraft “Ciudad de Viana”: organized by the Ikastola (the local Basque school), on Palm Sunday. 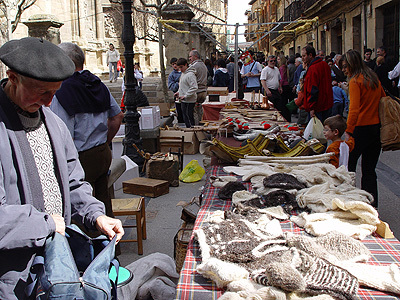 The best handicraft of Navarre and its neighbouring communities is exhibited and sold there. Music, dancing and rural sport add charm to it. – The feast of La Magdalena, the 22nd July: This is the most important one. There is an incredible number of ways to amuse oneself here: entertainments such as “vaquillas, gigantes and cabezudos,” gastronomic tastings, fire-bull and concerts. – The feast of La Virgen de Nieva, the first Sunday after the 8th September: long ago, these festivals were the most important after harvesting and threshing. Nowadays, they are still very popular. – Gastronomic weekend, the first week of November: Restaurants create their own specialised menus. Furthermore, different food industries can be visited and there is a popular contest of tapas or pinchos (Hors d´oeuvres) in which bars and restaurants take part.